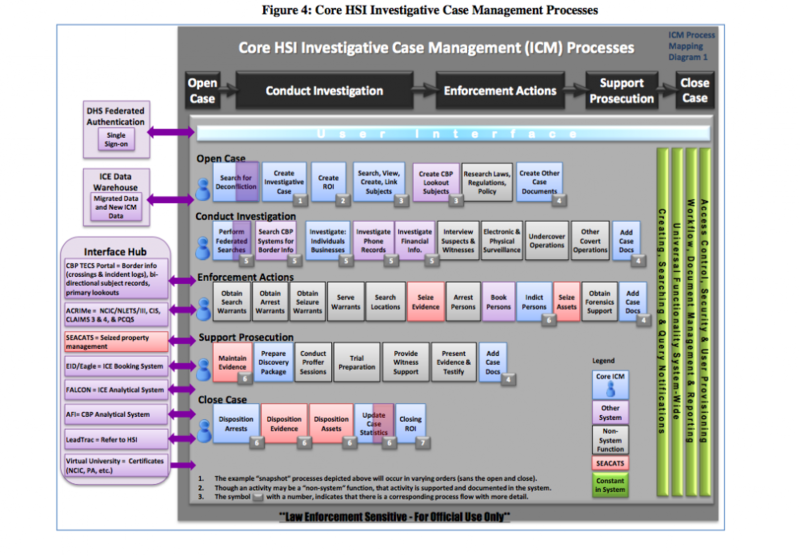 A new report from The Intercept details the new intelligence system called Investigative Case Management (ICM), built by Palantir, that is going live this fall and could assist Donald Trump’s efforts to deport millions of immigrants. The system, developed through a $41m contract awarded in 2014, is designed to help ICE (Immigrations and Customs Enforcement) agents identify illegal immigrants by collating data from a half-dozen law enforcement databases. By cross-referencing data from the FBI, ATF, DEA, and other entities, ICM can build a profile including a person’s job, background, schooling, relationships, address, criminal record, and other data. This can be used to drive mass deportations of illegal immigrants in U.S. President Trump has promised to do just that and one of the founders of Palantir, Peter Thiel, is a pal. Intelligence gathering refers to the process of collecting information relating to a particular organization or phenomenon based on a variety of information available within and outside the organization. Through intelligence gathering, a person may be able to forecast the future behavior or conduct of the organization in question as well as recommend alternative courses of actions in tackling future challenges. Governments and related security agencies such as armies or militaries and law enforcement agencies like the police usually use intelligence gathering to conduct researches on terrorist groups. Intelligence gathering entails collecting, reviewing and analyzing past and present information available about a particular organization or situation. Various techniques such as networking and mapping, imagery, observations and electronic communication can be used during intelligence gathering. In relation to the Boko Haram group in Nigeria, the intelligence community may use intelligence gathering to collect information relating to the organizational structure, funding, operations and network or linkages of the group. Palantir is a data-analytics company that does work for agencies like the NSA and the FBI. Nigeria needs an equivalent which can help the Police, SSS and other law enforcement agencies to be more effective in information gathering, analysis and application. This solution must be innately Nigerian and cannot be an imported ICM (from Palantir) or any other foreign company. The Nigerian system will have an Analytical Framework for Intelligence engine, with capability to pull data from a host of national, state, and local law-enforcement databases to create profiles of individuals, including personal details, travel histories, and even social relationships. This can be modeled to detect patterns of behavior and stop the bad guys before they cause problems. The National Assembly may need a new law to support building this solution in the country, if the existing law does not cover its creation. There are many startups in Nigeria that can help government build this solution. Government could use this as a vehicle to deepen the relationship between local companies and the state. A system that is organic and evolving can only be created by Nigerian companies. One company, Milonics Analytics, has components to make this work. There are other companies within CC Hub nexus that can step forward. The fight against Boko Haram and terrorists can only be won with solid and refined intelligence. Nigeria needs that apparatus. Mr President is winning the physical fight against Boko Haram. The Administration needs to win the data fight. Building an ICM clone for Nigeria will be very critical in making sure the nation has the intelligence to have sustained success over terror today and in the future.